Whether it is repairing a fuse box at home, rewiring at your business or installing a solar panel, it is essential to appoint electrical contractors who have the knowledge and training to undertake numerous duties across a wide variety of situations. The role of an electrical contractor depends on their experience and the type of job assigned to them. A typical contractor will set up and maintain or repair electrical infrastructure. They have a thorough understanding of how electricity works, the functioning of electrical components and the safety involved. These reasons make it beneficial to enlist the services of a qualified electrician when dealing with a complicated and unsafe electrical project. 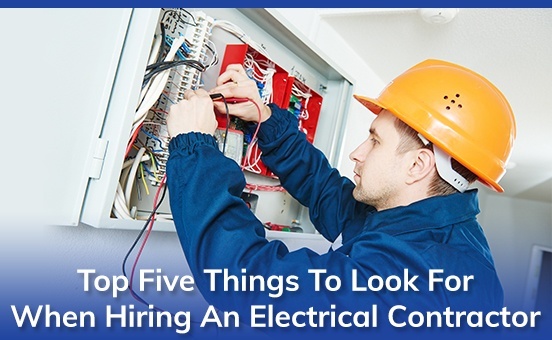 However, at SAM Electrical Services LTD., we understand that making a selection like this may not always be easy, which is why we’ve compiled a list of points to consider before employing an electrical contractor. Look for professional electrical contractors who specialize in many areas so that they can offer you the best products and services. They are well-equipped to solve all your electrical problems. At SAM Electrical Services LTD., we provide professional electrical services to residential, commercial and industrial sectors, so we have the capabilities and expertise to handle all your electrical needs. An electrical service upgrade can be expensive but more importantly, dangerous, if handled on your own. Upgrading has become a necessity to withstand modern electrical demands. When hiring a contractor, seek out professionals who can update your home’s electrical system to minimize risks and assure future protection. A panel upgrade is as crucial as an electrical service upgrade. It is the main fuse box from where electricity is powered to your home and appliances. When this gets damaged or worn out, it should be immediately replaced or upgraded. At this time, it is vital to have a licensed electrician to address the issue. 4. Inspection of electrical wiring. To prevent faulty wiring and ensure the system stays in working order, experienced contractors are required to perform an inspection. You have to be extra careful when hiring someone to do this type of work since it is a life-threatening situation. 5. Renovation of electrical wiring. When you don’t want to risk overloading your old wiring system, you call a team of qualified electrical contractors to examine the system. They will tell you if your home needs renovation or rewiring or replacement, and the estimated budget required. If you need electrical services in Calgary, AB, consult the expert contractors at SAM Electrical Services LTD. We have over thirty years of experience delivering residential, commercial and industrial services to clients across Calgary, Cochrane, Airdrie, Chestermere, Okotoks, Langdon, Priddis, Bragg Creek, High River, and Strathmore. We are accredited with the Better Business Bureau making us licensed and insured. We deliver twenty-four-hour electrical services based on our core value of honesty, integrity, and value. To learn more about the services we provide, please click here. To ask us questions, please contact us here. Copyright © 2018 - SAM Electrical Services Ltd.